Infinity Ward co-founders Jason West and Vince Zampella have formed a new game studio and signed an exclusive deal with none other than Electronic Arts, a move Activision claims "comes as no surprise." The Modern Warfare masterminds announced the formation of Respawn Entertainment today, a new venture which "will focus on creating state-of-the-art gaming experiences for global audiences." The new studio is being funded by seed capital from EA, according to the LA Times, and has signed an exclusive distribution deal with the publisher, but in an unusual twist, West and Zampella will retain full ownership of the IP they create. "Respawn Entertainment marks a fresh start for Jason and me," Zampella said. "For the past decade we led a great development team and poured our hearts into creating an epic game franchise. We're very proud of what we built - and proud that so many millions of fans enjoyed those games. Today we hope to do it all over again - open a new studio, hire a great team, and create brand new games with a new partner, EA." "Now that the team is in control of the games and brands, we can ensure that the fans are treated as well as they deserve," West added. West and Zampella formed Infinity Ward after leaving 2015 Inc., which had developed Medal of Honor: Allied Assault for the PC. 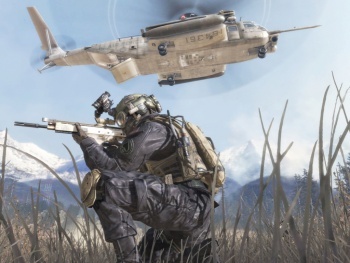 The Call of Duty franchise it established quickly and decisively shouldered the Medal of Honor series into near irrelevance. "It has a certain irony to it," EA Games President Frank Gibeau admitted. "But the fact that they were in this situation was a stunning opportunity for us." UPDATE: As reported by Joystiq, Activision has responded to the news of West and Zampella's new venture with the following statement: "This agreement comes as no surprise to Activision given the myriad of improper activities detailed in the cross-complaint filed on Friday against Jason West and Vince Zampella. We look forward to continuing to work with Infinity Ward's deep bench of proven talent on exciting new projects." That position, of course, dovetails with Activsion's assertions in its lawsuit that West and Zampella were "scheming" with its closest competitor - that being Electronic Arts - including a "secret trip by private jet" to meet with senior executive, presumably with the intention of jumping ship.